RV0777: What a wonderful day..........Why? Why you ask? First of all, I'm just glad to be alive today. I'm glad that I woke up this morning. I'm especially grateful that I have an input into how I'm going to live in my future. I know what I want and will concentrate my efforts, and my actions, into shaping a new life for myself. I'm quite certain not everybody will agree with my choice, but it's my choice and I'm the only one who sees my vision. I did expect some objections from my friends and family. I talked to my cousin Cheryl, who lives in Austin Texas. She's inherited the mantle of "Queen of the Family". I expected some chastisement about responsibility, staying rooted, and certainly not leaving my lakeside, paid for house where I live for the past 23 years. Nope! In fact what she said to me was " I can see you being a full-time RV'er." Of course, her dad, my uncle Huland, was an avid camper and RV enthusiast. Being a few years older than me, she has known me all my life. She knows I like to wander. When I explained my goals to my motorcycle riding buddies, most of them tell me they are jealous. Even though I've had some minor disappointments, I'm glad I'm marching to my own drummer. On my header I stated that I would be traveling with my two fur kids For the uninitiated, fur kids are four-legged, furry children. In my case, my two kids were born as toy poodles, but they think they are people now. I don't know what it is about full-time RV people and motorcycle guys, it seems a lot of us gravitate towards smaller breed dogs. My ex-wife, bless her little heart, left me with my first poodle. His name was Walker. He was a traveler and a trooper and accompanied me on many RV trips. 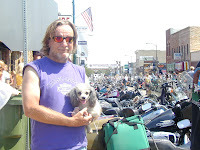 We probably traveled through 25 or more states together.﻿ The picture below was taken in South Dakota and a motorcycle rally. 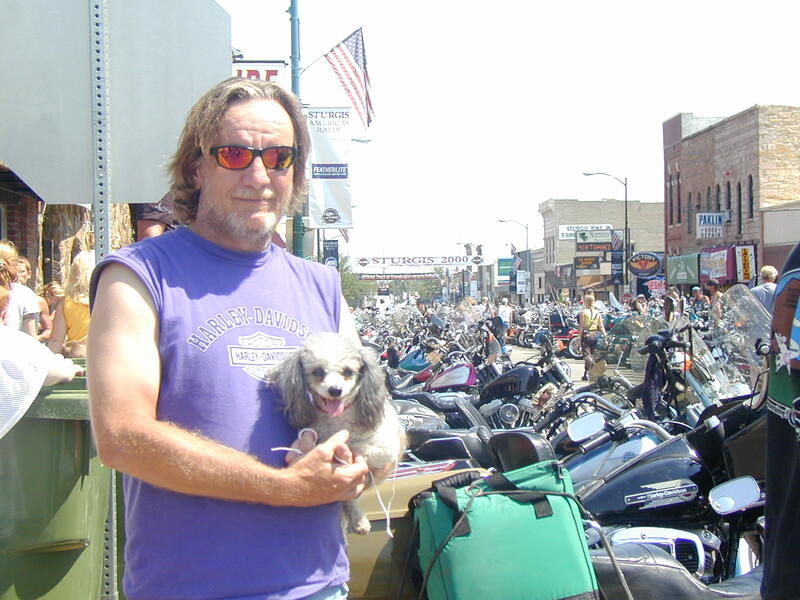 Walker was was known for jumping up in my lap while I was sitting on the Harley, with it running. He had no fear. ﻿ Walker is no longer here, but I will never forget him. He was a loyal little hound dog. 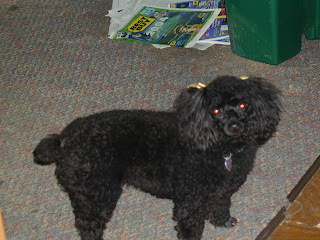 All is not lost though, we are not suffering from a poodle shortage. First, I would like to introduce you to Cammie. She is the Princess around here. She just turned 10 years old. She is quite a traveler in her own right. Cammie has been to Daytona Beach, Florida, three times. She's been to New Mexico, Arizona, Austin Texas and on many other exciting adventures. She's a very good dog.and she loves to go! Cammie was also given to me. Before meeting Walker and Cammie, I never thought of myself as a poodle-person. I've had Rottweilers, German Shepherds, Husky/Chow, but a toy poodle? The AKC says that poodles are the most intelligent breed. I agree 100%. Sometimes, too smart. ﻿New to the family is handsome Toby. He is one year old. He's a good traveler around town, but he hasn't been on a road trip yet. Toby is the first poodle I actually got for myself. He is a delight to be around and is a constant clown. He's a great addition to our family. He's a little afraid of the Harley. Maybe that will change when we actually get out on the road. The truly amazing thing about dogs and people is that we are resilient and adaptable. Toby seems to catch on pretty quick. I'm a fan of these little poodles for a number of reasons. They don't shed. They don't eat much so they are easy to clean up after. They are very intelligent and Very Quick. The day has been pretty wonderful. For I am truly blessed.